So I was doing some websurfing instead of...wait a minute! The only thing I have to do is...knit! Yes, I need to look for apartments but I did what I could for today and there is nothing else I need to do! Wow, I can die happy. Wait! No I can't! That was the point of this post. I started looking on Harry Potter websites, and my HP scarf starting calling to me from my bag of UFOs. Here is a pic from before. It still looks the same. It is quite sad. What is worse was that I was thinking of getting the pattern for Hermione's bobbled and cable hat. 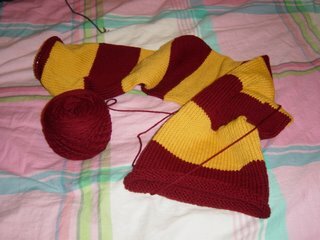 But, believe it or not, I am feeling guilty about starting another HP project without finishing the scarf. Hmmm...maybe I should knit a pair of HP socks. It would just be striped socks in gold and burgundy. That would be okay, right?